23 miles of coastline, taking in everything from granite reefs of exceptional beauty to smooth shores of fine, white sand. 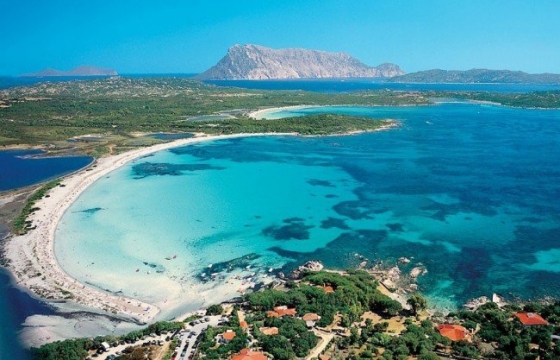 With its stunning beaches and unrivalled natural beauty, San Teodoro offers unique, intense experiences throughout the year, ranging from the simple, warm embrace of the sun, caressed by the sea breeze, to the pure thrill of kitesurfing, and from excursions to discover the best places in which to observe the numerous species of resident seabirds, all the way to the unforgettable feeling of watching the sunset from the seashore, across from the majestic island of Tavolara. The lagoon is without doubt one of the most interesting attractions on the north-east coast of Sardinia. With its deep seabed, the lagoon extends for over two miles and plays host to a plethora of species of fish, including golden grey mullet, sea bass, eel and flathead mullet. The lagoon is also very well equipped for some serious birdwatching. From here, you can admire the behaviour of such airborne species as the heron, the yellow-legged gull, the little ringer plover and the kingfisher, amongst many others. At certain times of the year, you can savour the spectacle of the colonies of pink flamingos. The lagoon is surrounded by a wide variety of Mediterranean maquis constituted by mastic, myrtle, rosemary and juniper. For more information, please visit the lagoon’s official site. Monte Nieddu (the Black Mountain) is surely a must-see for all those who love trekking and hiking. A wild, impassable place, the granite massif reaches an altitude of almost 1000 metres with Punta Magghjori, and in the past was home to forests of ancient holm oak, juniper and a number of typical Mediterranean plants. The mountain is inhabited by an array of fauna. With a bit of luck, you will come across boar, goat, marten, wildcat, the peregrine falcon and the golden eagle. A number of small watercourses are to be found on the mountainside, which along with little natural pools also create some very evocative waterfalls. The mountain is a favoured haunt of both walkers and mountain bikers. Founded in 1989, the museum was conceived as a way to allow visitors to experience a part of the history of San Teodoro through the ruins discovered in the area and on the surrounding seabed. The objects on show cover the period from 350 B.C. right up to the Middle Ages – when San Teodoro was on one of the main trade routes between the ports of the Tyrrhenian Sea and Sardinia – and include various containers for the transporting of wine, cereals and olive oil. Some of the finds bear witness to the probable presence of Arab pirates and merchants, particularly in the area stretching from Capo Coda Cavallo to the island of Molara. For more information, visit the Museum’s official site. Established in 1997, the Marine Protected Area is considered one of the most important sites in the whole of the Mediterranean. The commitment to safeguarding this natural paradise has resulted in the prohibition of sailing, fishing, hunting and, more generally, any underwater activities that involve contact with the seabed. However, in certain zones of particular interest for their remarkable flora and fauna, undersea dives are available through specialist diving centres. There are also sections where you can bathe and go snorkelling. More information is available on the Marine Protected Area’s site.